At a Catholic Schools Week event Jan. 29 at St. Mark School in Bristol are, from left, Maria Sanson, school principal; Father Dennis Mooney, pastor of St. Mark Parish; and Debra Brillante and Judy Sweeney of the archdiocesan Office of Catholic Education. A pride of “Lions” offered up a standing ovation then began chanting, “Father,” “Father,” “Father,” as Father Dennis Mooney entered the gym of St. Mark School in Bristol on Thursday, Jan. 29. It was a surprise for the parish pastor, who was not aware that he was to be the focus of attention during one of several Catholic Schools Week functions. The occasion, he discovered, was to honor him for his dedication to Catholic education. The kids call themselves lions, which is their school mascot and which also represents the evangelist St. Mark, traditionally depicted in art as a winged lion. 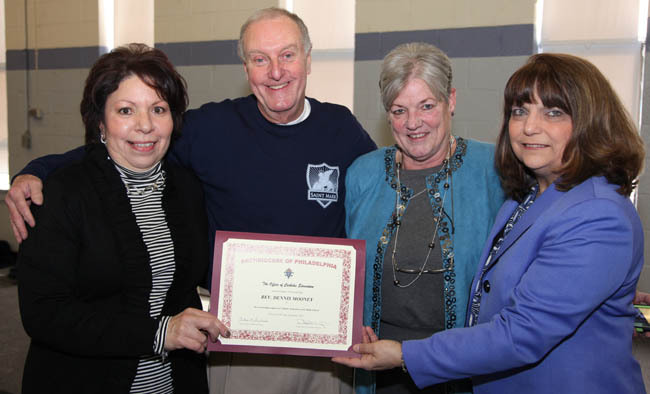 When the cheers and chants ended and the students took their seats, Debbie Brillante and Judy Sweeney of the Archdiocese of Philadelphia’s Office of Catholic Education, came forward and presented Father Mooney with a certificate recognizing him as the Bucks County Pastor Dedicated to Catholic Education. Father Mooney called the school and its students “the love of my life.” He also referred to the three months of “lost sleep,” referring to the three months in 2012 when he and parishioners waited to hear whether St. Mark would be among the Catholic schools to be merged with another school, or be allowed to remain open. When church bells rang at 11 a.m. March 21 of that year, parishioners rushed to the school to join the children in cheering and celebrating the archdiocese’s decision that the 125-year-old school would remain open. There was further cause to rejoice last year when the parish was notified that it would remain open, merging with its sister parish in Bristol, St. Ann. The pastor’s example can be found in even the youngest of St. Mark students, including Haley Roach, a fourth-grade student whose smile lit up her face as she spoke of her classes at the school. “I love learning about my faith. It’s so awesome. I feel bad that a lot of people don’t know about their faith,” she said. Third-grader James Fiorentino, a reader of adventure stories — evident in the armful of books he carried from the school’s Catholic Schools Week book fair — and who declares himself a future Philadelphia Eagle, said he likes going to St. Mark’s because he has lots of friends, and everybody at the school is nice to him. “I like to learn about Jesus and everybody that lived back then, like St. John the Baptist. My favorite story is about the lost lamb,” Fiorentino said, referring to Luke 15:1-7, when Jesus taught the parable about the lost sheep and the repentant sinner. James’ classmate, Tommy Cardi, said he likes his classwork and learning about his faith. “And, I don’t get bullied here,” Cardi said. Several regular parishioners also attended the ceremony, including women affectionately dubbed “the Church Ladies.” For the past several years, the women of the group have attended daily Mass before heading a few blocks north to the local diner, the Radcliffe Café, where they have breakfast and socialize. Anna Larrisey, a longtime “Church Lady,” said that the group came to the school for what they knew was some kind of award ceremony, but weren’t sure what it was about. They were pleased, Larrisey said, that representatives from the archdiocese were honoring the pastor. Larrisey, who serves as an extraordinary minister of holy Communion and the parish coordinator for baptisms, recalled how hard Father Mooney fought to keep first the parish school, and later the parish itself, open. She also admires him, she said, for his love of the children of St. Mark’s. “Every day at Mass he really gets to the kids with something they like from children’s stories then ties that into a spiritual message. I just think he’s terrific,” Larrisey said. The archdiocese recently resurrected an old tradition of honoring one pastor from each of the six counties it covers: Bucks, Philadelphia, Delaware, Chester and Montgomery counties, said Judy Sweeney, director of education and government programs for the Office of Catholic Education. The following pastors also were honored during Catholic Schools Week: Father Christopher Redcay, St. Patrick, Malvern; Father Joseph L. Maloney, St. Aloysius, Pottstown; Father Joseph M. Corley, Blessed Virgin Mary, Darby; Father Michael J. Reilly, St. Richard, South Philadelphia; and Father Alexander Masluk, St. Martha, Northeast Philadelphia. “It’s hard to come up with just one pastor because they all are so dedicated,” Sweeney said. But Father Mooney was the right choice for Bucks, Brillante added. “Father Mooney is certainly a well-loved man,” Brillante said. School Principal Maria Sanson expressed delight at the choice of St. Mark’s pastor for the honor. “It goes to show how devoted to our little school Father Mooney is. It’s an honor to have him as our pastor,” Sanson said. St. Mark Parish was founded in 1845. The school opened in 1887 and, for its first 100 years, was staffed by the Sister Servants of the Immaculate Heart of Mary. Many of today’s students make up several generations of families that attended St. Mark School.